This is an erect, up to 40″ tall, perennial forb that rises from fibrous roots. The stems are stout and round in cross-section. They are covered below the middle with coarse, stiff hairs, above the middle with both hairs and glands. The leaves are alternate and pinnately divided into up to an odd number of leaflets. The largest leaves have 7, 9, or 11 primary leaflets. Between each pair of primary leaflets there is another, much smaller pair of secondary leaflets. At the base of each compound leaf is a pair of leaf-like appendages (stipules). The stipules are ⅜″ to ¾″ long, lance-shaped to almost egg-shaped, and coarsely toothed or narrowly lobed. The stipules of the middle stem leaves have an elongated, lance-shaped lobe or tooth at the tip. The leaflets are lance egg-shaped, 1½ to 2 times as long as wide, and conspicuously veined. The upper surface is hairless or nearly hairless. The lower surface is smooth or rough to the touch; sparsely covered with more or less appressed hairs, especially along the veins; and conspicuously dotted with glands. The margins are coarsely toothed. The inflorescence is a short-stalked, spike-like, densely crowded, unbranched cluster (raceme) of many flowers at the end of the stem and upper branches. The central axis of the raceme (rachis) is densely covered with fine, short, ascending hairs. There are no glands on the rachis. The inflorescence elongates in fruit. The flowers are about ¼″ in diameter. There are 5 overlapping green sepals, 5 yellow petals, and 5 to 15 stamens. The hypanthium is top-shaped and conspicuously grooved. There is a line of white, appressed hairs in the grooves and two or more rows of hooked bristles on the outer rim. The bristles are strongly ascending or erect. The fruit is 1 or 2 achenes concealed within the hypanthium. 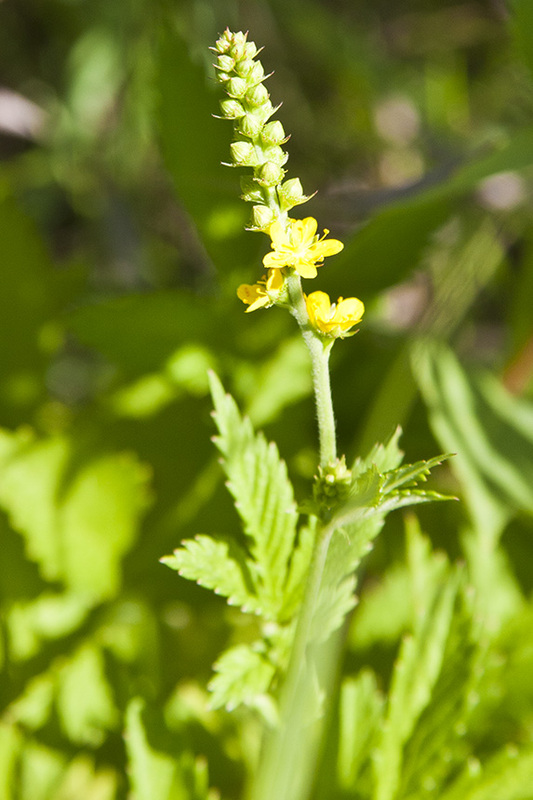 The relatively short, densely packed raceme distinguishes this from all other Agrimonia species. 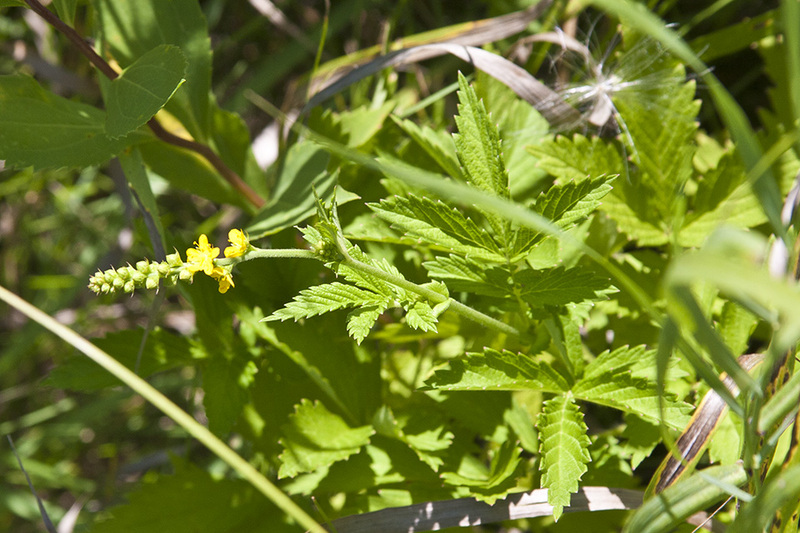 Common agrimony (Agrimonia gryposepala) largest leaves have 5, 7, or 9 primary leaflets. The rachis is conspicuously covered with gland-tipped hairs as well as scattered, long, spreading hairs. The grooves on the hypanthium do not have a line of white hairs. The outer bristles on the rim of the hypanthium are widely spreading or bent backward. Soft agrimony (Agrimonia pubescens) largest leaves have 5 to 13 primary leaflets. 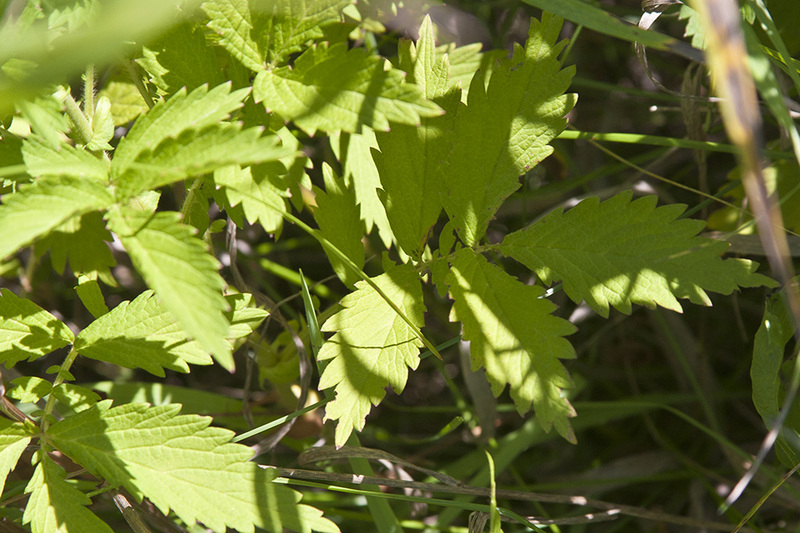 The leaf undersides are velvety to the touch with strongly spreading hairs. Glands on the underside of the leaf are absent or are inconspicuous and hidden by the longer, velvety hairs. The stipules of the middle stem leaves are egg-shaped to kidney-shaped and do not have an elongated tooth or lobe at the tip.